The M1928A1 was the military version of the ''Tommy Gun'' also known as ''Chopper'' ''Chicago Typewriter'' and ''Chicago Piano''. General John. 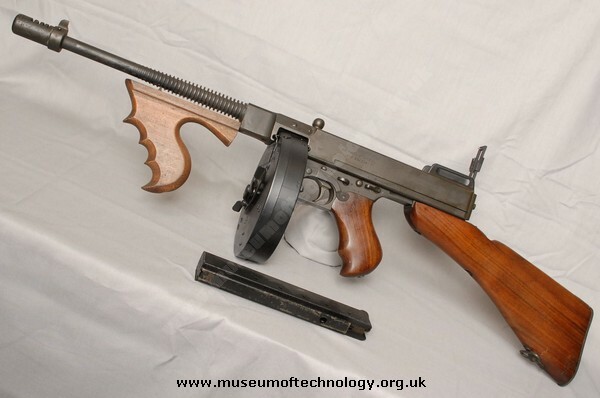 T. Thompson designed the first model in 1916 and started with the help of a financier, formed the 'Auto Ordinance Company', where the phrase ''Sub Machine Gun'' was first used. The first weapon he produced was called ''The Annihilator'', too late for the Fist World War, the gun was renamed the ''Thomson Machine Gun'' and subsequently went into production in 1921. In the days of American ''Prohibition'' it became popular with gangsters and grew to fame in the Hollywood movies. In 1938 the pattern was adopted by the U.S. Army with the M1928A1 entering into production just before the attack on Pearl Harbour. It has a 50 round magazine, although this had a rattle and the 20 or 30 round magazine was preferred. Early models tended to rise on firing so the 'Cutts'' compensator was fitted to the barrel to compensate for this. It fires .45inch ACP (Automatic Colt Pistol) rounds at a rate of fire of 800rpm. The military version used the stick magazine and the forward pistol grip was changed for a barrel grip. The Thompson Sub Machine gun in the photo is NOT the typical configuration of the M1928A1 Thompson Sub-Machinegun. The typical configuration was a horizontal forearm and 20 rd. or 30 rd. stick magazine (most commonly 20 rd. stick mags). The pictured configuration was more often used by law enforcement of the era. The vertical grip was not practical for military use, especially when firing from cover.